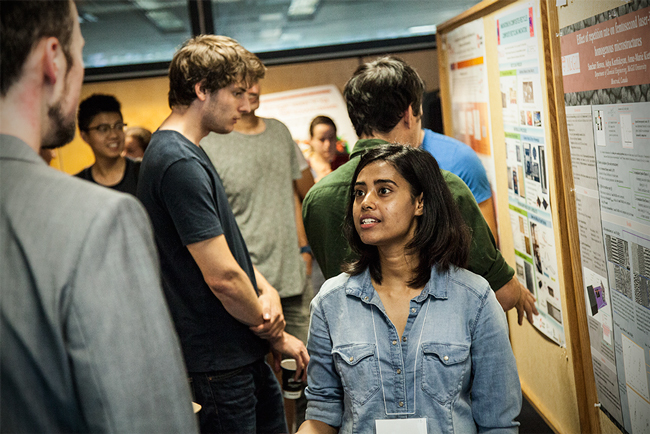 More than 40 graduate students from the Faculty of Engineering presented their research results via poster presentations at the fifth annual McGill Engineering Research Showcase (MERS) held by the Faculty of Engineering on Monday, Sep. 25. MERS is a showcase and celebration of graduate student research in the Faculty of Engineering that also provides a forum for industry to connect with McGill’s graduate students and faculty. Attendees from industry and McGill faculty, students and alumni were also able to learn more about the innovative research taking place in the areas of Advanced Materials & Nanotechnology, Aerospace Engineering, Bioengineering, Information & Communications Technology, and Sustainability in Engineering and Design.